For some Pentagon officials, the demonstration in October 2007 must have seemed like a dream come true — an opportunity to blast reporters with a beam of energy that causes searing pain. The event in Quantico, Virginia, was to be a rare public showing for the US Air Force's Active Denial System: a prototype non-lethal crowd-control weapon that emits a beam of microwaves at 95 gigahertz. Radiation at that frequency penetrates less than half a millimeter into the skin, so the beam was supposed to deliver an intense burning sensation to anyone in its path, forcing them to move away, but without, in theory, causing permanent damage. However, the day of the test was cold and rainy. The water droplets in the air did what moisture always does: they absorbed the microwaves. And when some of the reporters volunteered to expose themselves to the attenuated beam, they found that on such a raw day, the warmth was very pleasant. A demonstration of the system on a sunny day this March proved more successful. But that hasn't changed a fundamental reality for the Pentagon's only acknowledged, fully developed high-power microwave (HPM) weapon: no one seems to want it. Although the Active Denial System works (mostly) as advertised, its massive size, energy consumption and technical complexity make it effectively unusable on the battlefield. The story is much the same in other areas of HPM weapons development, which began as an East–West technology race nearly 50 years ago. In the United States, where spending on electromagnetic weapons is down from cold-war levels, but remains at some US$47 million per year, progress is elusive. “There's lots of smoke and mirrors,” says Peter Zimmerman, an emeritus nuclear physicist at King's College London and former chief scientist of the US Arms Control and Disarmament Agency in Washington DC. Although future research may yield scientific progress, he adds, “I cannot see they will build a useful, deployable weapon”. For many critics, the US HPM program has become a study in wishful thinking, exacerbated by a culture of secrecy that makes real progress even more difficult. The quest to build an electromagnetic weapon — an e-bomb, in military jargon — was sparked on 8 July 1962, when the United States carried out Starfish Prime, the largest high-altitude nuclear test that had ever been attempted. The 1.4-megaton thermonuclear warhead, detonated 400 kilometers above the central Pacific Ocean at 9 seconds past 11 p.m., Hawaii time, blasted huge swarms of charged particles outwards along Earth's magnetic field. Their gyrations generated a pulse of microwave energy that drove measuring instruments off the scale. Artificial auroras lit up the night across swathes of ocean. And in Honolulu, more than 1,300 kilometers from the detonation point, the pulse set off burglar alarms, knocked out street lights and tripped power-line circuit breakers. Nothing like Starfish Prime has been seen since August 1963, when the Partial Test Ban Treaty outlawed nuclear explosions anywhere but underground. But the test showcased the potential destructiveness of an electromagnetic pulse to military planners on both sides of the cold-war divide, and launched them into a race to harness it as a weapon using a non-nuclear source. The US Air Force has been the main funder of the country's HPM program from the beginning. At first, its goal was a weapon capable of taking out an enemy's computers, communication systems and other electronics. In theory, the idea remains compelling: an e-bomb would be able to fire microwave 'bullets' at the speed of light and, if tuned to the right frequencies, disable its targets without collateral damage. Cars could be stopped in their tracks, radars blinded and computers destroyed, with no need for high explosives. But that goal has foundered on the HPM weapon's main technical challenge: generating a pulse that is directed enough to pick out a specific target and powerful enough to have an effect when it gets there, ideally using a generator that is small and light enough for an airplane or missile to lift. 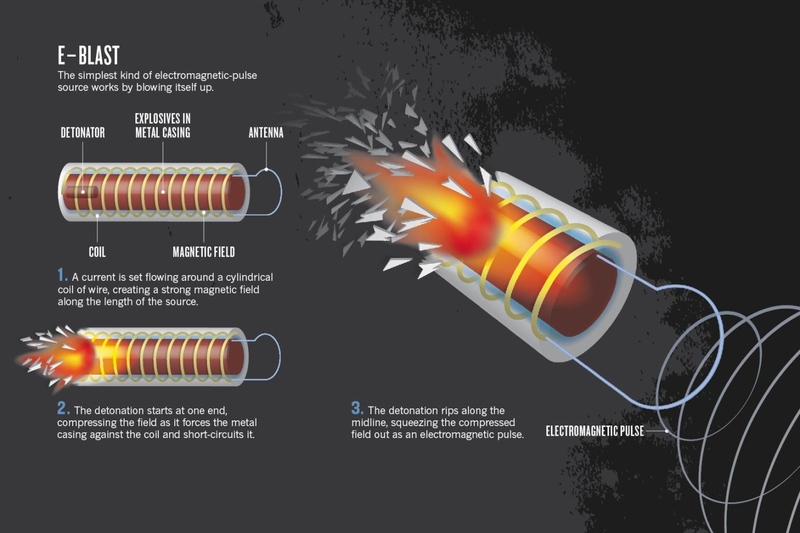 A battery-powered device can generate an HPM pulse, but producing the kind of highly concentrated power needed to destroy electronics typically requires detonating a conventional explosive inside a device that destroys itself in the act of pulsing (see 'E-blast'). Because doing this inside a piloted aircraft is risky — “a few pounds in the right place will take down anything”, notes Zimmerman — the Air Force has in recent years pursued HPM weapons designed for single-use missiles. For example, the Counter-electronics High-power Microwave Advanced Missile Project (CHAMP) is an experimental cruise missile designed to take out electronic targets such as production sites for weapons of mass destruction. Neither the Air Force nor Boeing, its main contractor for CHAMP, will discuss technical details of the program. But the project is just a prototype; when CHAMP was flight-tested last year, it still didn't include the HPM payload. It is possible to make a microwave generator compact enough for a missile. Engineers at Texas Tech University in Lubbock have developed an experimental explosive-based source less than 2 meters long and 16 centimeters in diameter (M. A. Elsayed et al. Rev. Sci. Instrum. 83, 024705; 2012). But lead developer Andreas Neuber points out that there are physical limits: to maximize the microwave power while keeping the system small, the engineers had to increase the internal electrical field. The result can be a catastrophic failure of the system's insulating materials that short-circuits it before the system can build up much power. In short, more than 20 years after the Gypsy test, scientists still can't reliably predict the damage a weapon would do. And that is without even considering the countermeasures that an adversary might use, which could be as elementary as surrounding sensitive electronics with a Faraday cage — the equivalent of the aluminum mesh used to shield microwave ovens. The effort to disable electronics has remained mostly secret. But in 2001, the Air Force publicly announced that it had made substantial progress in developing microwave weapons that target people, when it unveiled the Active Denial System. Development of the system began in the 1990s with the Air Force's efforts to explore the biological effects of microwaves. A project code-named Hello studied how to modulate the clicking or buzzing sounds produced by microwave heating in the inner ear, to produce psychologically devastating 'voices in the head'. 'Goodbye' explored the use of microwaves for crowd control. And 'Good Night' looked at whether they could be used to kill people. Only the Goodbye effect went into development as a weapon. Further bioeffects research was conducted in secrecy at Brooks Air Force Base near San Antonio in Texas, but even that program almost stalled when the weapon was ready to move from animal to human testing. Hans Mark, a nuclear engineer at the University of Texas at Austin who was then the Pentagon's director of defense research and engineering, paid a visit to Brooks in 2000 to check out the work. “Dr Mark didn't believe in the effect,” recalls Beason, “and he actually had a shouting match with one of the main researchers.” But Mark's approval was needed to advance the project, so he agreed to be subjected to the beam. The Air Force got its human tests. The Brooks scientists joke that “you've never seen a political appointee run so fast”, says Beason. Mark says that his doubts about the Goodbye effect were rooted in what he calls the “extravagant claims” made by its advocates. If nothing else, he says, the superconducting electromagnet that powered the system's pulse generator required a cooling system too big and cumbersome to be used in the field. Mark says that he allowed the system to proceed to human testing not because he was convinced that it would work, but because after exposing himself to the beam, he decided that human testing at least wouldn't harm anyone. “Almost all of this program has been a waste of money,” he says. Mark's concerns have proved prescient: efforts to deploy the weapon have been futile. At the 2001 unveiling, the defense department touted the Active Denial System for use in peacekeeping missions in places such as Kosovo and Somalia. But after the invasion of Iraq in 2003, when the US Joint Non-Lethal Weapons Directorate offered to deploy the Active Denial System to the region, it was rebuffed. “We knew it wasn't reliable,” said Franz Gayl, the Marine Corps's science and technology adviser, in an interview last year. Worse, he said, the pulse generator was so big that it had to be carried on its own utility vehicle. “That was a recipe for disaster,” said Gayl, “because the operators are going to be a target.” And worst of all, he said, before use the system had to be cooled down to 4 kelvin — a process that took 16 hours. The defense department tried to deploy the weapon in Afghanistan in 2010, but it was sent home unused. In the same year, California rejected a smaller version meant for use in prisons. The device was built by defense contractor Raytheon of Waltham, Massachusetts, which declines to discuss it. Other weapons have fared little better. The Air Force Research Laboratory developed an HPM system called MAXPOWER to detonate roadside bombs remotely, but it was the size of an articulated lorry — too unwieldy to be deployed in Afghanistan. The Joint Improvised Explosive Device Defeat Organization, the defense department's bomb-fighting agency, declined to discuss the system, citing classification issues. But it did say that, as of 2011, it was not funding MAXPOWER. In July, General Norton Schwartz, the Air Force chief who retired last month, warned that the service would have to withdraw from some science efforts amid budgets cuts, but that HPM technology would still be pursued. It “clearly has potential”, he told the trade magazine Aviation Week & Space Technology, warning that countries such as Russia could be ahead of the United States. The concern that other nations, or even terrorists, could be working on similar technology seems to have been one of the prime motivations for the US military to continue investing in microwave weaponry, despite the apparent lack of progress. According to a 2009 briefing on non-lethal technologies prepared by the Office of Naval Research and obtained under the Freedom of Information Act, Russia, China and even Iran are pursuing HPM programs — and the UK Defense Science and Technology Laboratory at Fort Halstead is sponsoring a classified car-stopping program. But such programs are not necessarily proof that the cold-war HPM arms race is still going on. At least some countries may — like the United States — be conducting research out of fear of becoming vulnerable to such weapons. Modern technologies such as mobile phones are particularly susceptible to HPMs, says Michael Suhrke, head of the electromagnetic effects and threats business unit at the Fraunhofer Institute for Technological Trend Analysis in Euskirchen, Germany. The secrecy that surrounds HPM weapons research seems to have greatly exacerbated technical obstacles to the program. In 2007, for example, a report on directed-energy weapons by the Defense Science Board said that the Pentagon had not effectively used data collected by university researchers to understand microwave effects. The Air Force claims that sharing is better now. But working in a field shrouded in secrecy still affects how information is disseminated. Neuber, for example, could agree to answer questions for this article only if he replied in writing, and only after his responses had been cleared through the US Army office that sponsors his team's work.